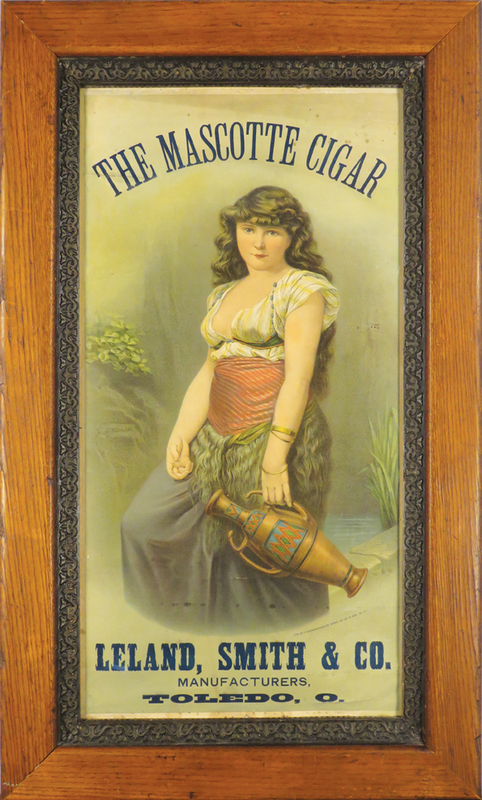 I found this early Leland, Smith & Company Mascotte brand of cigar advertising to say the least. Typically when collectors find early lithographs from the late 1800’s and early 1900’s they find very pretty woman or girls adorning the ads. The young woman featured on this lithographic appears to be a bit heavier than typical, and she doesn’t smile. Maybe the company was ahead of their time by not having to show a woman with a tiny waist as you often see? I think it makes for interesting conversation either way. Did the lack a smiling face help or hurt sales for the Leland, Smith & Co. Manufacturers? We will probably never know, however, the lack of much information on the internet about the company suggest their sales were not that brisk, or they were bought out by another company fairly early in their business run. A letterhead from 1883 says they were “Importers and Jobbers” of “Cigars, Pipes and Smoking Materials”. It also says the were manufacturers agents for tobacco. This seemingly tells me the company was truly a distributor and not really a tobacco manufacturer of their own products. Hopefully time will provide me more information on this company. THE WYANDOTTE INDIAN SOLD DETERGENT…BUT WHY?ELVES DELIVERY BEER BY AIRSHIP AT THE LEMBECK & BETZ BREWERY!